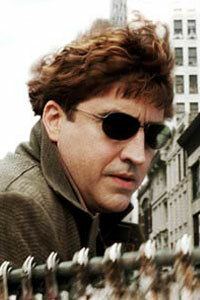 Otto Octavius, played by Alfred Molina, is one of the leading minds of his time, exploring the use of tritium as an energy source. After an experiment gone wrong fuses four mechanical arms to his back and kills his wife, Rosalie, Otto gives up his former life and becomes the Spider-Man villain Dr. Octopus. As Dr. Octopus he robs banks in an attempt to get funds to redo his failed experiment, putting him at odds with New York City’s superhero: Spider-Man. When Spider-Man wins their first skirmish, Dr. Octopus retreats back to his home base. Realizing that they have a common enemy, Dr. Octopus strikes a deal with Harry Osborn. Once Dr. Octopus brings in Spider-Man, Harry will fund his experiment. As part of a plan to lure Spider-Man out of hiding, Dr. Octopus tries to kidnap Mary Jane. The event leads to a confrontation between Dr. Octopus and Spider-Man on a train. When Spider-man realizes that the train is going to fall of the tracks, he risks his own life to save the people of New York City, Exhausted from the rescue attempt , he falls to the ground unconscious. Dr. Octopus takes Spider-man’s body to Osborn in exchange for more tritium. As he moves forward with his failed experiment, Spider-Man—now free from Osborn—arrives in the nick of time to stop him. Dr. Octopus suddenly understands the consequences of what he’s done and in one last redemptive gesture, he tries to take down the dangerous tritium with him and sink it in the bottom of the river— a final sacrifice to save the city.